I love red Rioja. Spain has much more to offer the wine enthusiast than just Rioja, but Rioja can make very fine wines indeed – hence its fame. The trouble with Rioja is the question of what you are going to get. They aren’t all good, some are downright ordinary in fact, so you must be wary. However, red Rioja can deliver a great deal of pleasure and many very high quality wines. As far as good value is concerned though the picture is also mixed. I generally hold it to be true that cheaper Reservas and Gran Reservas, from bodegas that have no fame or are just made up brands for the supermarkets, are normally not worth drinking. For me the reliable, value category of red Rioja is the Crianza level, which spend the shortest time ageing in oak. However, one of the great joys of wine is that every now and again a wine pops up that confounds our beliefs. Recently I presented a very well received tasting of the wonderful wines of CVNE, one of the truly great Rioja houses recently. All the wines were really good, but for me the absolute star wines were the magnificent 2012 Imperial Reserva, ready to drink and wonderfully refined and elegant – stockists here and here – and the quirkily delicious 2014 Monopole Clasíco white. 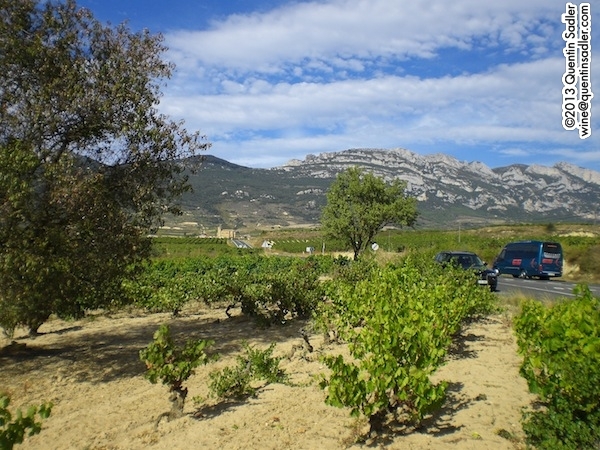 CVNE, like many of the original band of Rioja bodegas, are based in Haro. I showed a fabulous Crianza from CVNE’s Viña Real estate in Rioja Alavesa. It offered rich fruit and lots of character and showed just how good a Crianza wine can be. However, good though it was, another wine stood out for the mix of quality and amazing value for money. Indeed I liked it so much that it is my Wine of the Week. Founded in 1879 and still owned and run by members of the founding family, C.V.N.E. – the Compañía Vinicola del Norte de España – is one of the great Rioja houses. I love showing their wines at tastings because they have such a wide range of styles, quality levels and labels as their stable includes the famous Monopole range, the great classic Imperial wines and the two single estate wines of Viña Real and Contino. The wines labelled as Cute – CVNE in old copperplate script – are their base level wines, but still very good in my opinion. The Barrel Fermented white is a wonderful example of getting the oak just right, while the Crianza is a great value gem and the Cune Reserva is, to quote my friend Tom Canavan, a ‘proper wine’. However it is this beauty that currently represents the most amazing value for money and it is a really lovely wine. The blend is 85% Tempranillo, 10% Graciano and 5% Mazuelo – no Grenache – from vineyards around Haro in Rioja Alta. It is aged for ged for 2 years in mainly American oak, but some French oak as well, and 3 years in bottle. The French oak allows for a little tingle of tannin that suits the wine. This is an unashamedly rich Rioja, the lack of Grenache allows the dark fruits to hold sway. It has spice, vanilla, dark plums, blackberries and blueberries on the nose with a light dusting of fresher red plum and raspberry too. The palate is soft, silky, refined and deeply upholstered – sumptuous in fact. There are some savoury, leather notes, a little bite of tannin and some nice freshness all giving definition. It has wonderful concentration – the vintage was very good – with loads of ripe fruit and good length and could have a long life ahead of it if you can resist. Whether you drink it or keep it, I would recommend that you grab some now – 92/100 points. Drink it with lamb, beef or roast pork, but above all, drink it. Available in the UK @ £12.50 per bottle – yes £12.50! from Tesco and Tesco Wine by the Case. Recently I led a tasting of wines made by Bodegas López de Heredia in Rioja – it was at the West London Wine School, check out more of their tastings here. All the wines were excellent, but even in such exalted company, some stood out from the pack. The undisputed highlights were the astonishing 1994 Viña Tondonia Gran Reservas, both red and white, which were wines of incredible finesse and beauty. As you might expect, wines of that quality and age are not cheap, but there were some stunning wines at lower prices that offered superb value for money too. I loved one of them so much that I have made it my Wine of the Week. 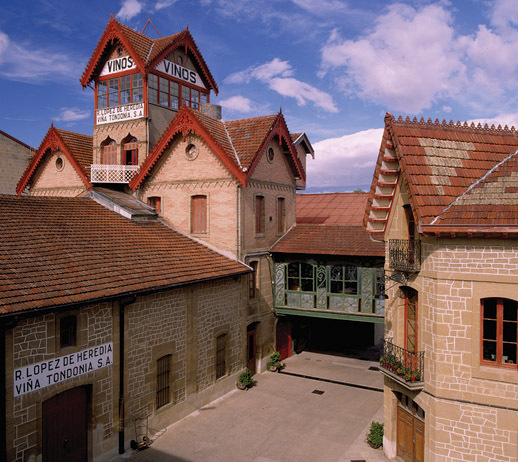 Bodegas López de Heredia was only the third bodega to be founded in Rioja after the wine revolution began there in the 1840s-1860s. They were founded in 1877, so really were at the forefront of making Rioja the great region that we know today. 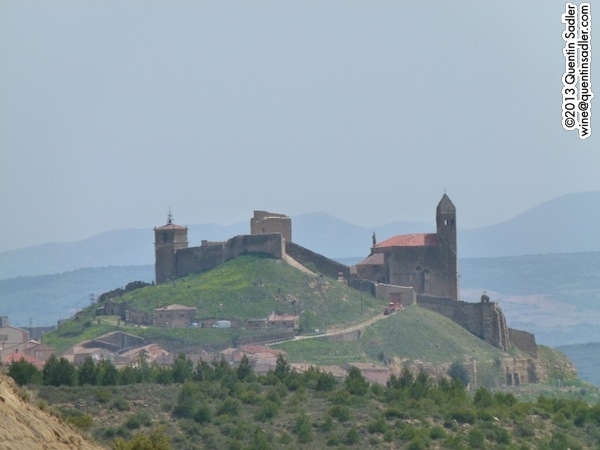 Rioja’s development was a slow process in truth, you can read a history of Rioja that I wrote by clicking here, it is a story worth reading as it might not quite be what you expect. López de Heredia was founded by Don Rafael López de Heredia y Laneta and it is still owned and run by his family to this day. A visit there is always worthwhile as it widely regarded as the most traditional Rioja producer there is. Rioja actually took quite a while to develop its style and to formulate its ‘traditions’, even López de Heredia. Oak ageing was used from the beginning, it was what set Rioja apart from the rest of Spain, but the use of the terms Reserva and Gran Reserva was not established until the 1920s at the earliest and the ageing regulations were not established until the 1940s. So whether the wines are traditional or merely idiosyncratic, I couldn’t really say. I just know they are very good. The wines are very unusual, especially the whites. They undergo long ageing in wood and develop very complex characters as a result. This ageing leads to a note of oxidation in the white wines that is not totally unlike a Fino or Manzanilla sherry. This resemblance can be over stated though, I do not really enjoy Sherry, but I love these wines, so don’t let that idea put you off. 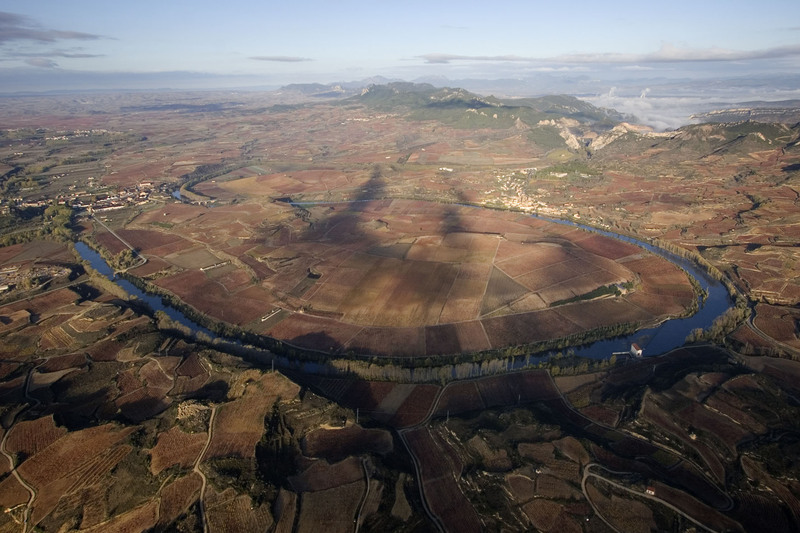 López de Heredia’s vineyards, Viña Tondonia is contained within the loop of the Ebro River in the foreground, Viña Gravonia is just behind – photo courtesy of the winery. They make their most famous wines from their Tondonia vineyard, which is why Viña Tondonia forms part of the company’s name. Tondonia can be either red or white and are labelled as Reserva or Gran Reserva. They also produce red Reservas and Gran Reservas from the nearby Viña Bosconia vineyard, while their red Crianza is called Viña Cubillo and comes from the Viña Cubillas vineyard. Their white Crianzas come from the Viña Laconia vineyard and are labelled as Viña Gravonia. 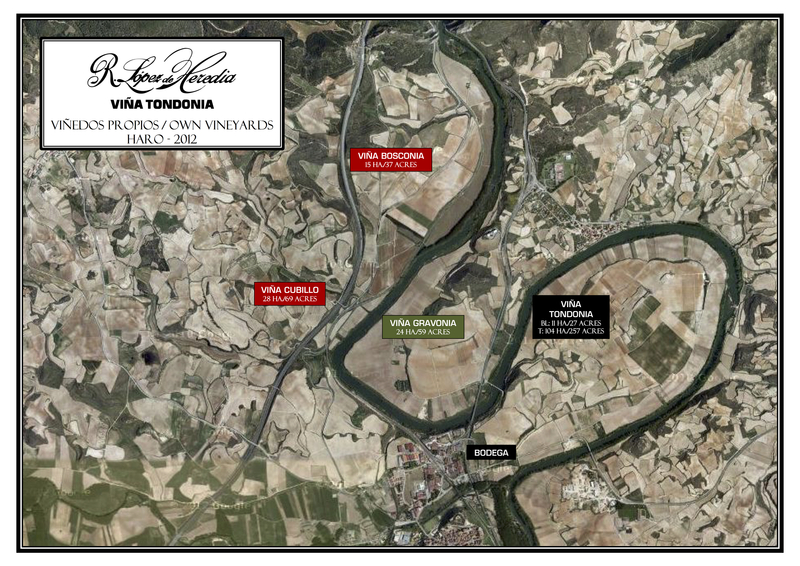 Map of López de Heredia’s vineyards – courtesy of the winery. 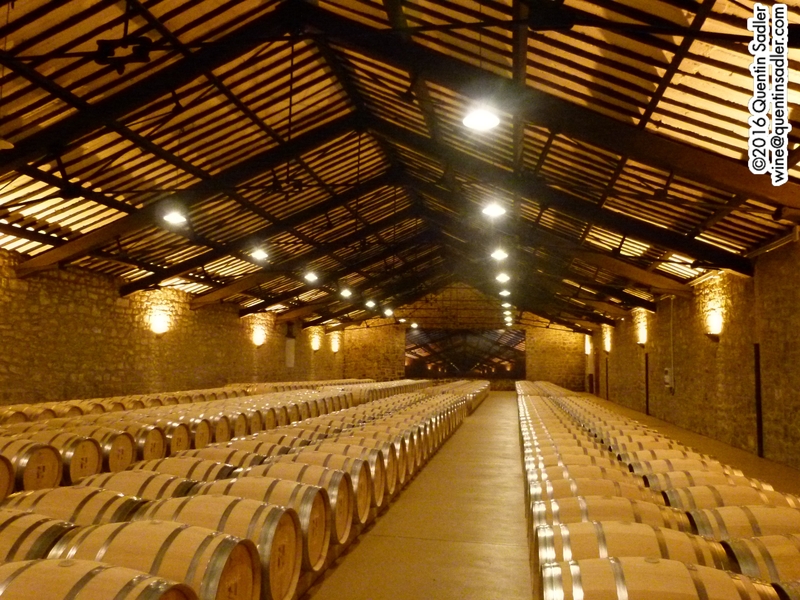 All of these wines are aged for a lot longer in wood than the regulations require. Gran Reserva reds spend 9 years in barrel and the whites 10 years. Reservas spend 6 years in barrel, while red Crianzas are aged for 3 years in barrel and the whites for 4. López de Heredia stick to using American oak, as is traditional in Rioja – you can read why here. However, it is American oak with a difference. They buy whole trees and ship them to Spain where they are split, seasoned outside and turned into barrels. This contrasts with American oak barrels made in America which are sawn – which cuts the grain allowing more flavour to come out – and seasoned in a kiln, which concentrates the lactones to give that creamy, sweet vanilla character so typical of American oak and Rioja. So although López de Heredia age their wines in American oak for a long time, it is a more subtle process than you might expect. Also the wines are aged for a short time in new oak before being racked into old, neutral barrels for the extended ageing. 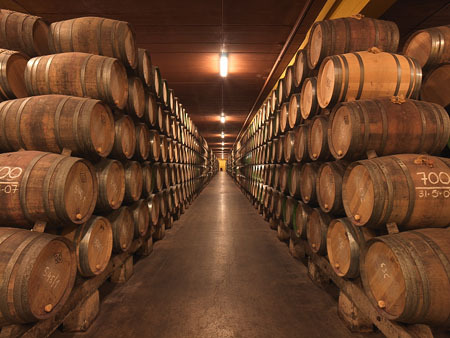 Barrel ageing at López de Heredia – photo courtesy of the winery. The Viña Gravonia Crianza Blanco is 100% Viura, the Tondonia whites also have 10% Malvasia to make them a little richer. It was fermented in big wooden vats with a spontaneous fermentation of the wild yeast and then aged for 4 years in barrel. The nose is extraordinary, with that touch of Fino sherry, toasted almonds, olives, a note of the sea, honeysuckle, beeswax, gentle spice, orange pekoe tea, firm white peach, quince and orange peel. The palate is dominated by the acidity and mineral character together with cinder toffee, honeycomb, dried apricots, caramelised orange, waxy lemon and almonds. There is even a very subtle feel of tannin on the long, long finish. It is an extraordinary wine and has a little more weight, concentration and fat then the more widely available 2006 vintage – 2005 was the better year. Try it with classic fish dishes like sole meunière, or grilled Dover sole, but I expect it would be great with just about any fish dish, anything in a creamy sauce and roast chicken too – 93/100 points. Available in the UK for around £19 per bottle – for stockists click here. It won’t be for everyone, but this wine is a delicious example of a really rare style of wine. It certainly excited me at the tasting and thrilled everyone else there too. What’s more it gives an idea of what these great old style Rioja whites are like without having to pay a fortune. Do try it or a Viña Tondonia white if you can. My first Wine of the Week for 2016 and very possibly my Wine of the Year in 2015 – although there is some stiff competition and I could easily choose something else – was rather fittingly the wine I was drinking as the new year began and 2015 was consigned to history. I had struggled to think of what to drink with my slow cooked garlicky lamb – not because I did not know what to serve with it, but because I had far too many options as lots of different wines go brilliantly. Grenache, Claret, Cabernet, Merlot, Rioja, Ribera del Duero and Jumilla would lead the pack for reds for me, but whites can work very well too, especially Marsanne and Rousanne blends. In the end I chose something really, really special and I am very glad that I did. It was a Rioja from Contino which is a single estate winery in Rioja Alavesa just a little north and west of Logroño. Many of you may be surprised that I emphasise that it comes from a single vineyard or estate, but that is quite rare in Rioja. Most Rioja is a branded product made from fruit sourced from a number of vineyards – much like Champagne usually is – and single estate wines are very far from being the norm. Contino was the first single estate Rioja wine, certainly in modern times, and it was created in 1973 by the Real de Asúa family. This enterprising bunch – or their ancestors anyway – had previously set up the great Rioja house of CVNE in 1879 and their descendants continue to run CVNE (often written as Cune) – Compañía Vinicola del Norte de España or The Northern Spanish Wine Company – who produce Monopole, Imperial and Viña Real wines as well as Contino. In fact the family had bought grapes from the vineyard that became Contino for many decades and used them in their Viña Real wines, the modern Viña Real estate and winery is very near Contino. According to Jesús Madrazo, the charming, affable, inquiring and wonderfully talented winemaker at Contino, they always knew these grapes were special and so when the owners came to CVNE and explained that they wanted to retire but had no heirs to take the vineyard on, they jumped at the chance to acquire this amazing 62 hectare estate. It is situated just north west of Logroño and the Ebro river wraps around the estate making it appear to be a south facing peninsula. The vineyard is in effect a shallow south facing slope and so acts as a sun-trap and produces wonderfully ripe and concentrated wines. 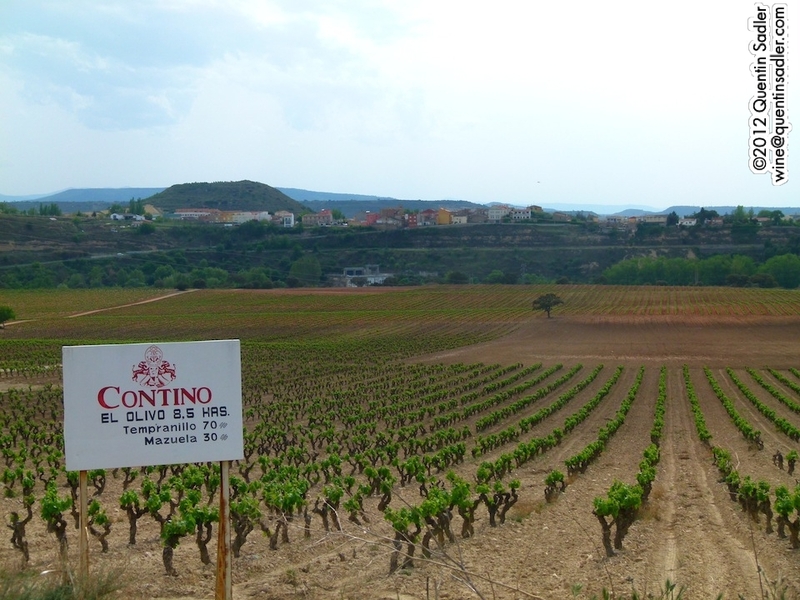 The 8.5 hectare El Olivo block on the Contino estate. José Madrazo Real de Asua was the family member who took on control of this estate and turned it into something very special in the region. José Madrazo retired in 2001 and sadly died in January 2015, but his son Jesús Madrazo took over the role has done a remarkable job of taking Contino to new heights. Over time they have changed the focus. Originally, as with most Rioja in those days, they blended all the grapes together, even the whites. For a few vintages now they have used those vines to craft one of the very finest white Riojas there is from a blend of Viura with Garnacha Blanca (Grenache Blanc) and Malvasia – actually that would have been great with my lamb too come to think of it. José Madrazo, the brilliant and charming winemaker at Contino. The main Contino wine is the red Contino Reserva, also available here, which never fails to impress me, but they now also produce some even more special wines. The pure Contino Garnacha (Grenache) is made from 70 years old vines and is one of the finest examples I have tried from Spain (together with these guys here). Their pure Contino Graciano is scintillating and a rare great example of this grape that should be better known. One of my favourite Riojas of all is always the wonderful Contino Viña Del Olivo wine made from a parcel of vines that surrounds an ancient olive tree – it is available here and here. However, in the truly great years Jesús also makes a little Gran Reserva. This is traditionally only bottled in magnums (1.5 litres or 2 ordinary bottles) and I do like a magnum as it looks so dramatic on the dinner table. Anyway I dug out a magnum of the 2005 Gran Reserva to go with my lamb and it was so very good that I have made it my first Wine of the Week of 2016 and also my Wine of the Year for 2015. Joven / Cosecha No oak ageing, or sometimes just a little. Oven never appears on the label, but often does on wine lists. Sometimes wines with a short amount of oak ageing are called Roble or Semi-Crianza, these are unofficial. Crianza 1 year oak or tank ageing plus 1 year ageing in bottle – Crianzas can often offer very good value for money. Reserva 1 year oak ageing plus 2 years ageing in bottle – these wines should only be produced in good vintages. Gran Reserva 2 years oak ageing plus 3 year ageing in bottle – these wines should only be produced in the very best vintages. This is a classic Rioja blend of 70% Tempranillo – 60 year old vines, 15% Graciano and 15% Garnacha aged for 36 months in American and French oak barrels. The American oak gives that classic touch of vanilla that is the hallmark of Rioja. 2005 was officially classified as an excellent – or rather excelente – vintage and produced some outstanding wines. Contino only made 2699 magnums of the 2005 Gran Reserva – mine was number 1236. The colour is deep and sumptuous, while the nose is rich, enticing, spicy and smoky with touches of vanilla, cedar and mocha as well as rich, dark plums and blackberry. The palate is rich with wonderful concentration of fruit which together with the oak ageing gives a smooth, supple and silky wine that is always powerful and textured in the mouth – which is relatively unusual for Rioja. The wine leans towards being full-bodied with even some creaminess, but some lively freshness gives lovely balance and elegance by restraining the power, which makes it really drinkable and enjoyable. The tannins are perfectly tamed by the ageing, with just a little fine-grain tannin definition on the finish to help the structure of the wine. This is powerful, but it is not a showy blockbuster, it is a truly elegant and serious wine, one of the great Riojas – 95/100 points. This truly is a great wine and I enjoyed it very much, but I think it would reward keeping for a good few years yet. There is no doubt that it needs food and is perfect with lamb, but it would also be fabulous with venison, duck or a good steak. Available in the UK for around £100.00 – £135.00 per magnum from The Halifax Wine Company and Harrods. Available in the US for around $140.00 – $170.00 per magnum from Woodland Hills Wine Company and Wired for Wine. This week I throw caution to the wind and celebrate tasting – and drinking – a rare gem from my cellar. It is most certainly not cheap, it isn’t widely available, but it was very, very good, so it is my Wine of the Week. I was teaching a WSET level 2 course and none of my students had ever tasted a really mature wine, so we cooked up a plan to share an old bottle from my collection. I spent a happy hour browsing through my bottles, wiping off the dust, and eventually I chose something really exciting. It had sat in my wine rack for well over twenty years just waiting for its moment and I crossed my fingers that it would live up to the hopes that we had for it. Actually I just hoped it was still alive and not corked. The bottle was a Rioja, but not just any old wine from that region. No this was the single vineyard 1970 Viña Tondonia Gran Reserva from the great Bodegas López de Heredia in Haro. Looking south across Rioja’s vineyards from the Sierra de Cantabria mountains. López de Heredia are unapologetically old fashioned even now, with long ageing and even producing oaky whites and rosés, but this wine was 45 years old. Franco was still dictator of Spain when it was made and Ted Heath was the UK Prime Minister. It was a very different world back then, without computers or the internet, cheap air travel or mobile phones – what’s more The Beatles hadn’t even officially split up and the first Moon landing was only the year before! I have visited the bodega once, a long time ago, but it always stays with you as the place is one of the iconic wineries of Spain and their story is pretty good too. Still family run, they were founded in 1877 by Don Rafael López de Heredia Landeta who was actually born in Santiago, Chile. However he was Spanish and when the family returned to Spain in 1869 he went to nearby Bayonne in France to study business. While he was there he must have seen the problems the French were having with their vines – this was in the depths of the phylloxera crisis – and the business potential of applying Spanish wine to French producers who had no wine of their own to sell – click here to read about this period of Rioja’s history. 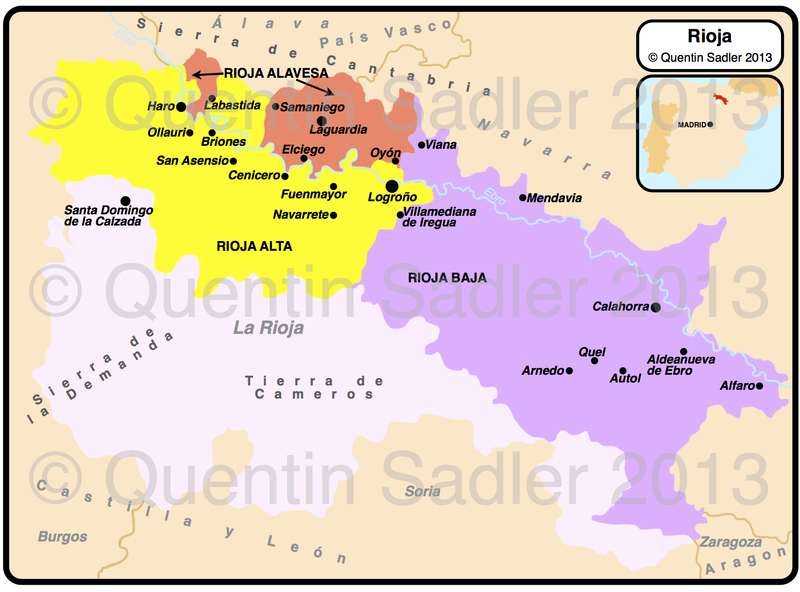 Map of Rioja – – click for a larger view – non watermarked PDF versions are available by agreement. Don Rafael established his winery in Haro, in the barrio, near the railway station – this area is home to a great concentration of the fine old established Rioja producers, including CVNE and Muga, as the railway made exporting the wines much easier than it was in the past. At first the winery was pretty small, but as demand grew he sought to expand – in every direction. First they set about digging cellars into the local hillside and then he wanted to enlarge the bodega buildings too. He did this by employing Galician stonemasons to turn the excavated stone into building material and then got an architect to design him an up to date winery that was much larger than he needed to allow for future growth. Amazingly it is still larger than they need, although they have expanded several times in to vacant buildings that Don Rafael put up back in the nineteenth century. The beautiful López de Heredia winery, complete with the Txori Toki tower. Photo courtesy of the bodega. As if developing downwards, by digging cellars, and outwards with more buildings was not enough, the winery was finished off with a lovely art nouveau tower that dominates that part of Haro and makes it impossible to miss the winery. This tower is known as the Txori Toki – bird tower in Basque – and its picture graces their wine labels to this day. 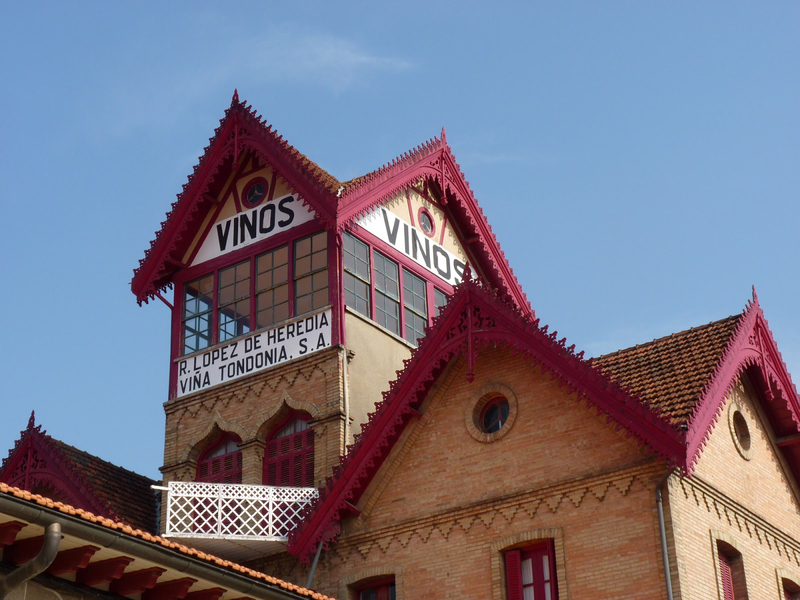 López de Heredia is a lovely bodega to visit, the buildings are beautiful and seem to capture the spirit of a time and a place in Rioja’s early history. The cellars are simply amazing with cavern after cavern opening up as you walk through them and you briefly like an explorer from a different age. At the heart of the cellars is a huge tasting room with an enormous round table and enjoying a tasting there is an experience that you never forget. 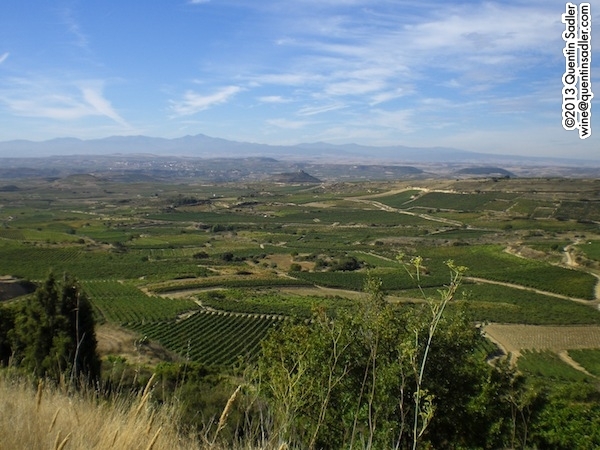 Unusually for Rioja their production has always been based upon their own vineyards and the core of their range is a series of single vineyard wines such as Viña Gravonia, Viña Cubillo, Viña Bosconia and most importantly the famous Viña Tondonia. This large, 100 hectare vineyard is so synonymous with the company, that its official name is Bodegas R. López de Heredia Viña Tondonia. This extraordinary site produces some of the most iconic and traditional Rioja ones in the form of their great reds, whites and one of the very last of the old style long barrel aged Rosados. 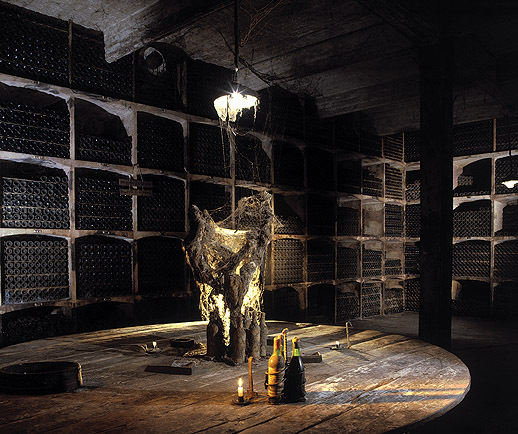 The tasting room deep in the cellars, photo courtesy of the winery. The blend is something like 75% Tempranillo with 15% Garnacha and some Mazuelo and Graciano. It fermented in wooden fermentation vats, before being aged for 10 years in 225 litre American oak barrels before being bottled. Opening wine as old as this is always a gamble and a bit of a worry, but I had stored it well in my small cellar the Big Yellow Wine Storage in Fulham, so I should not have worried and as soon as I sniffed it, I knew it was good. The colour was a real tawny orange and it had become transparent with age. The aroma was deep and savoury with leathery, earthy, meaty, mushroom notes together with some dried fruit – cherry, raspberry, prune, raisin – as well as orange, walnuts and rich coffee, it was really exciting sniffing this. The palate too was extraordinary, with plenty of life in it still. There was a nice refreshing, elegant cut of acidity and even a little smear of tannins on the finish, but everything was superbly integrated and had become a whole entity with a silky mouthfeel. The flavours were overwhelmingly savoury with smoky, meaty tones, dried fruit giving that glimmer of sweetness and an intensity that totally dominated my senses. Whats more I have never had a dry wine that had such a long finish, it went on for around 2 minutes! This was a great wine by any measure and what’s more showed no sign of being tired yet. Probably the finest old Rioja I have ever tasted – 95/100 points. I don’t drink, or even taste, anything like this very often, but when I do it reinforces my joy of wine and excites me enormously. The sense of history I get when I taste old wine is a real part of the pleasure, so if you ever get the chance to taste a really old Rioja, do give it a go. Looking south from the Sierra de Cantabria across Rioja Alavesa to the Ebro. Rioja’s fame exceeds that of all of Spain’s other wine producing regions. 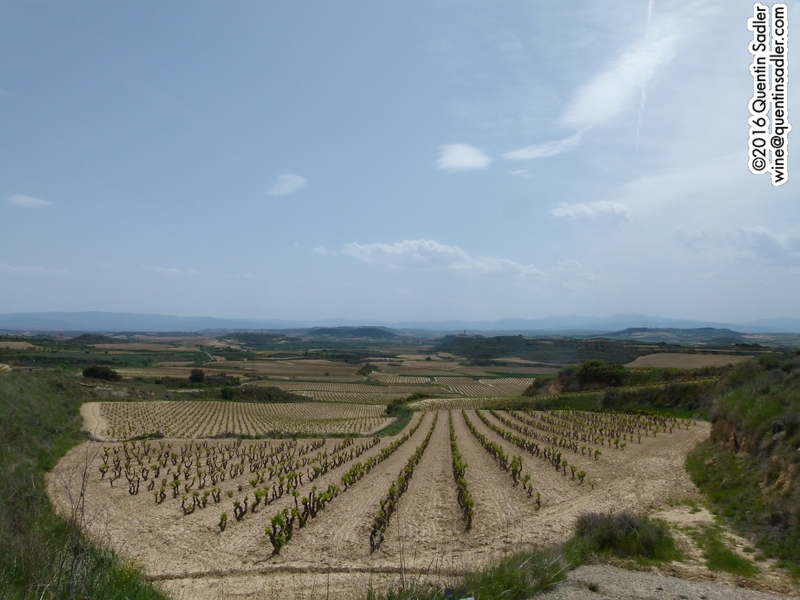 Many wine drinkers, me included, love Rioja – especially the red wines, but how Rioja became the famous wine region it is and how the wines came to be made as they are is an interesting story. Back before a handful of Bordeaux producers started carving out a new market for fine wine in the seventeenth century, most wine – including Bordeaux and Rioja – was pretty ordinary fare. Drunk mainly because it was safer than water, wine was just a part of everyday life in those parts of the world where grapes grew. Then as now Spain was covered in vines and awash with wine. Technology and understanding had not yet touched wine, so by and large the people who tended the grapes and made the wine merely watched the process take place. Nowadays winemakers control what happens in the vineyard and winery to achieve fully ripe grapes and to make clean wines. So, what put Rioja on the wine map? Why did the wine revolution happen so much earlier in Rioja than Spain’s other regions? 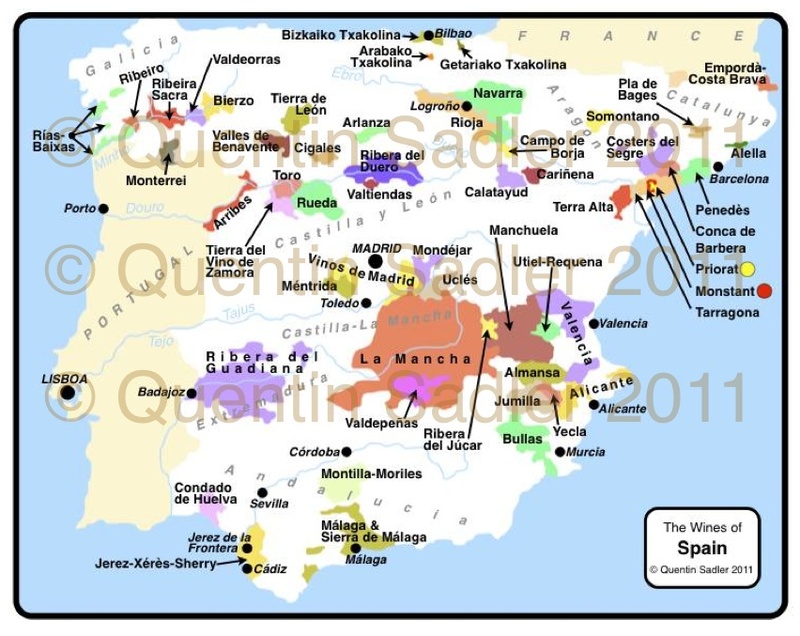 Map of Spain’s wine regions – click for a larger view. High-res non-watermarked versions of my maps are available by agreement. Map of Rioja – click for a larger view. High-res non-watermarked versions of my maps are available by agreement. From a location point of view Rioja has much going for it. The Sierra de Cantabria shelters it from the worst of the Atlantic rain, wind and cold – which prevent most of the rest of the Pais Vasco – or Basque lands – producing good red wines. 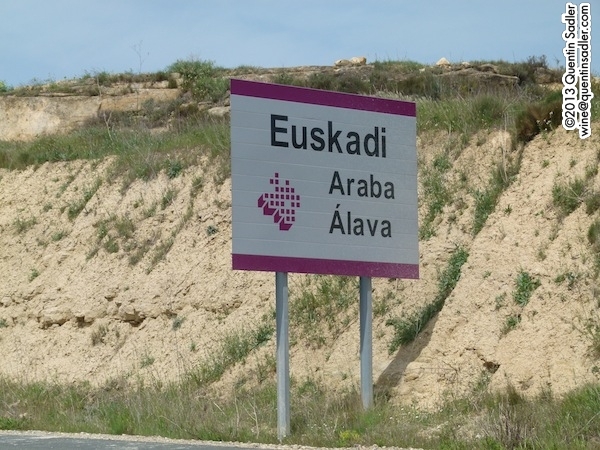 A small part of Rioja – Rioja Alavesa – is in the Pais Vasco and it seems that Basque merchants, whose lands hugged the cold and wet Bay of Biscay, noticed that this drier area just to the south could produce the richer, stronger wines their overseas markets demanded. In the past the big problem of course was transport, rough roads and ox carts could only transport so much and it must have been hard going to get the wine out. In those days the Spanish kept their wine in hog skins and served it from them too, so we can only guess what the wine would have tasted like after a few months – very different from even a basic wine of today. 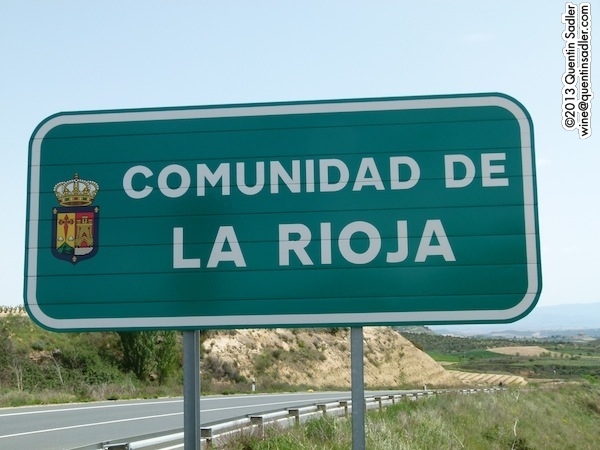 Most of Rioja is in Spain’s smallest autonomous region, La Communidad de Rioja. 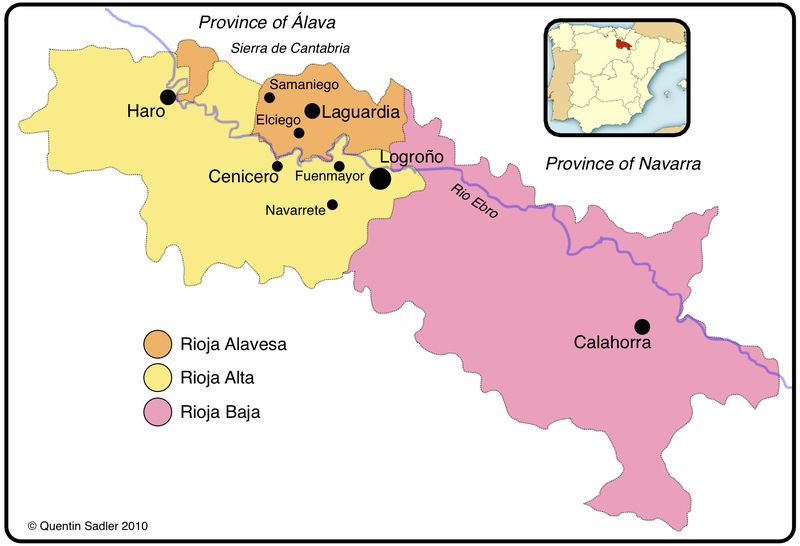 Rioja Alavesa though is in the Province of Álava in the País Vasco. On the cusp of the 19th century, only Bordeaux specialised in making fine wines for the wealthy. Surely many Basques and Riojans must have travelled north to see what it was that Bordeaux winemakers did to their wines that created their high reputation. Manuel Quintano was a Basque from the wine town of Labastida in Rioja Alavesa where his family owned land and made wine, and he certainly went to Bordeaux. Quintano was trained for the priesthood in Bayonne and this might be where he first came into contact with good red Bordeaux wines and perhaps where he saw qualities in them that his own wines lacked? Although ordained he became more and more interested in wine and in 1785 he travelled to Bordeaux to study how wine was made there. Labastida or Bastida in Basque. 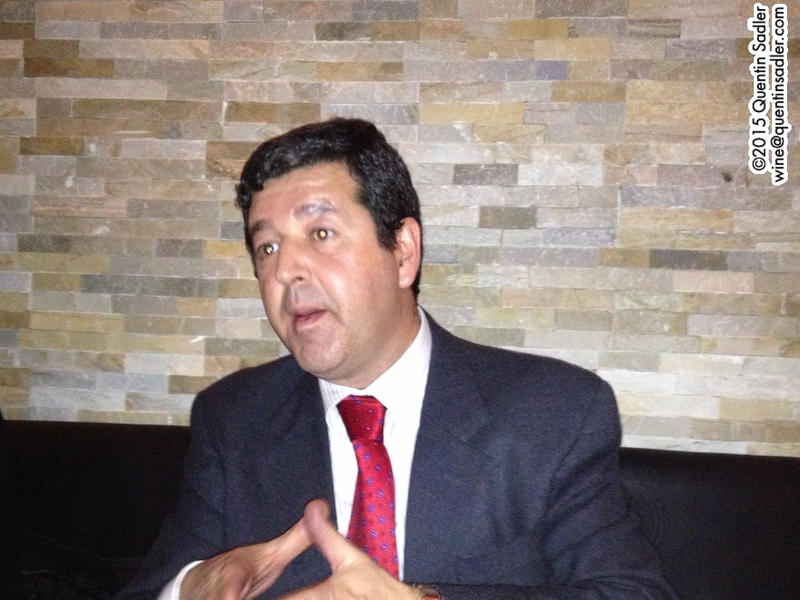 He noted every stage of production and the differences from how wine was made back home in Rioja. Amongst much else he found out about racking and clarification, but above all it is believed he became the first Riojan to notice the effect that ageing in oak barrels could have on a wine. It was this use of barrels that was the the most important thing Quintano learned. The oak did many things that were beneficial to the wine and these would have been especially noticeable in the days before modern vineyard and winery practices made rich, clean wines. The wood has a porous structure that allows a slight evaporation, which concentrates wine and allows in a trickle of oxygen that softens the tannin. This helps develop a more silky texture and this difference in mouth-feel between thin everyday wines and finer wines would have been much more obvious in the past when alcohol levels struggled to get above 11%. Barrel ageing at Bodegas La Rioja Alta – photo permission Bodegas La Rioja Alta. Of course the wood also effects the flavour of the wine, often giving vanilla, cedar, coffee, cocoa or caramel characters. All of this can often give an impression of sweetness and richness into the wine, which helps accentuate that sensation of concentration. However the most important thing the oak did for the wine was to make it live longer. The wood contains a polyphenol – or type of tannin – called ellagitannins that helps to protect the wine from oxidation. To most wine makers in the eighteenth century, whose wines only lasted a few months and visibly deteriorated over that time, this would have seemed like finding the key to eternal life. Quintano returned to Labastida in 1786 and set about applying what he had learned and successfully produced wine using these techniques. In 1795 he even exported wine to Mexico and Cuba, the first barrel-aged wines to be exported from Spain and it seems they arrived in perfect condition. However, not everyone was happy with these expensive developments and complaints were made to the Council of Castile – the government – who upheld that all Rioja wine must be sold at the same price. This of course made the cost of barrels and cellar ageing prohibitive and Quintano’s experiments ground to a halt. His achievements though were never entirely forgotten and today Quintano’s name is used for a range of wines produced by Bodegas y Viñedos Labastida. Also some of Quintano’s vineyards now form part of Bodegas Remelluri which is owned by the family of that modern revolutionary, Telmo Rodríguez. So the production of everyday wines carried on interrupted from time to time by the devastating effects of The Peninsular War and the various Carlist or Civil Wars of the early nineteenth century. The local people – and pilgrims en route to Santiago – still slaked their thirst with wines stored in skins while little trickles were exported to Bordeaux and elsewhere. This trickle turned into a torrent from 1850 onwards when oidium devastated the vineyards of Bordeaux. For ease of export these wines destined for overseas were transported in barrels. The best wines would often be selected for export and so the idea of barrels being associated with quality wine became widespread in Spain. Luciano de Murrieta – by kind permission Bodegas Marqués de Murrieta & Maison Marques et Domaines. Events then came together which ensured Rioja’s future as a fine wine region and this future was all about the use of oak. War played its part too, Luciano de Murrieta – later the Marqués de Murrieta – was on the losing Carlist side in the civil war of the 1840s and went into exile in London. It was here that he apparently came to admire the fine wines of Bordeaux. On his way back from exile in 1850 Luciano spent time in Bordeaux to study winemaking and brought the modern techniques he found to Rioja where the Duque de la Victoria, the former prime minister of Spain and his boss during the wars – owned vineyards. An early 19th century press at Faustino. 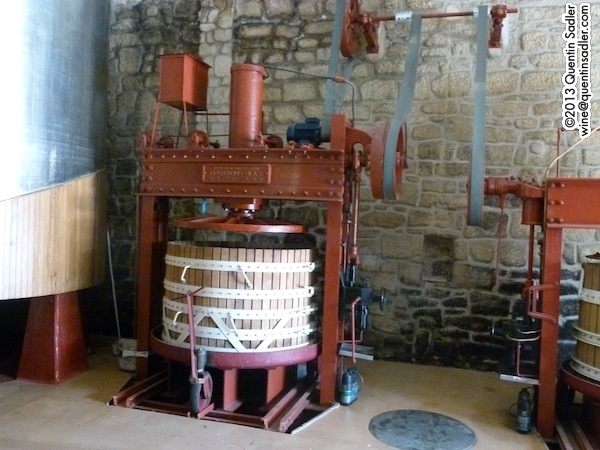 Much more hygienic evolution of the press by late 19th century – this one at CVNE can still be used. He set about making the fermentations more efficient and hygienic and then went looking for barrels. These were in very short supply and usually the wrong size, but it seems that even using make do casks Luciano proved his point. The wines had an intensity and a fragrance the everyday wines lacked and most importantly could enjoy a long life. The experiment was a great success with exports soon going to Cuba and Mexico. Luciano marketed his own brand from 1852 and moved to a new bodega at Ygay near Logroño in the late 1860s. Perhaps if this revolution had been left just to Luciano de Murrieta it would have happened very slowly, but luckily at least one other pioneer had also seen the future. The Marqués de Riscal had similarly fallen under the spell of Bordeaux wines and studied how they were made – also in 1850 as it happens – and he set out to build a state of the art winery, based on the most modern practices then used in Bordeaux. He planted Cabernet Sauvignon as well as Rioja’s own Tempranillo and even employed a winery manager from Bordeaux. It was a long project, the winery and first vintage were not complete until 1862, but the wine was an instant success and even won Gold Medals at expos in Bayonne in 1864 and Bordeaux itself in 1865. Riscal’s wines were in great demand and were the first Riojas to be sold in bottle. To ensure that the wine in the bottle was what he had made – and that it had not been drunk and then refilled by an unscrupulous merchant – he sealed his bottles with a wire mesh. This quickly became iconic and like his techniques became imitated by other Rioja producers. It helped that the railway arrived in Rioja in 1864 and linked it to Bilbao and Madrid as well as the French frontier and so Bordeaux. Finally Rioja could export its wines more easily and efficiently. So, by the 1860s because of a series of disasters, accidents, wars and study by inquisitive people Rioja had ceased to be a backwater for wine. Instead it had become a region producing wines, made by the most modern techniques, that were worthy of mounting a challenge to Bordeaux itself. Barrel shaving at Bodegas La Rioja Alta. Most Bodegas have their own coopers. Photo by permission Bodegas La Rioja Alta. So, Rioja was born and strangely enough oak, rather than grapes, was the dominating characteristic. What’s more French oak was expensive and rather bizarrely it seems that it was more normal even for the French to use Russian oak in the days before the Russian Revolution in 1917. So instead Riojans looked to the recently independent Spanish colonies in the Americas as their source of oak. These countries were their natural trading partners and a large market for their wines. The oak was plentiful, cheap and gave even more flavour than European wood – in fact it gave that rich sweet vanilla character, that has been the hallmark of Rioja ever since. Spanish drinkers as well as foreigners quickly came to love this rich and clear flavour that set Rioja wines apart from the other wines of Europe. Ageing in American oak had many benefits that made the wines very attractive to Spanish drinkers who had never before been able to enjoy high quality wines from their own country. The rich oaky vanilla flavour became a fundamental part of the wine style, as did the silky texture and smooth tannins. This came from the long oak ageing which also ensured, together with careful racking, that the wines had little or no sediment in the bottle, something the Spanish consumer favours to this day. So popular did the style become with the Spanish – and even now Rioja is more widely available in Spain than wine from any other region – that for well over 100 years only about 20% or so of production was exported. Rioja was the quintessential Spanish wine and this resulted in other regions copying Rioja’s techniques, style, even labelling and wire bottle seals. One unexpected result of Rioja’s oak ageing techniques was the virtual demise of estate wine. Historically growers had made their own wine, albeit in a rudimentary way, and sold that to their neighbours or merchants to blend with other wines. 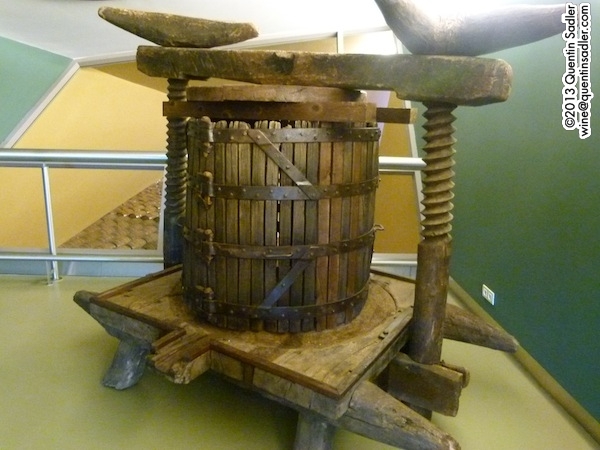 The new methods and the cost of the equipment put modern winemaking beyond their reach so most of these farmers focussed on growing grapes which they sold to the bodegas who could afford the oak barrels and the new equipment. Even now estate bottled Rioja is relatively unusual with bodegas traditionally buying much of their fruit from a spread of growers. It seems to me that in those low tech times this separation of skills could actually have been beneficial to quality. Nowadays we assume that estate wines are better, almost by definition, but this separation allowed the farmers to concentrate on growing better fruit while the winemakers could put their energies into turning them into good wine. It wasn’t universal by any means, but separating growing and wine making certainly became the norm and Rioja’s fame and reputation as a quality wine region stems from this moment. Viña Pomal from Bodegas Bilbainas is still a strong brand. 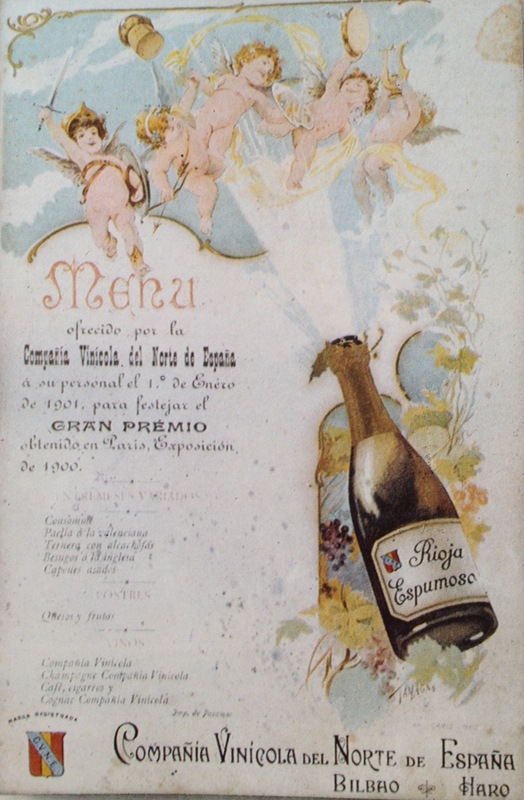 CVNE is another long lived Rioja brand, this menu card is from 1901. This also allowed for the creation of some really strong and long lasting wine brands which might not have happened if every grower had been marketing their own wines – after all France which had a more grower centric and fragmented wine industry has been hampered in its fight back against the new world by a real lack of strong wine brands. 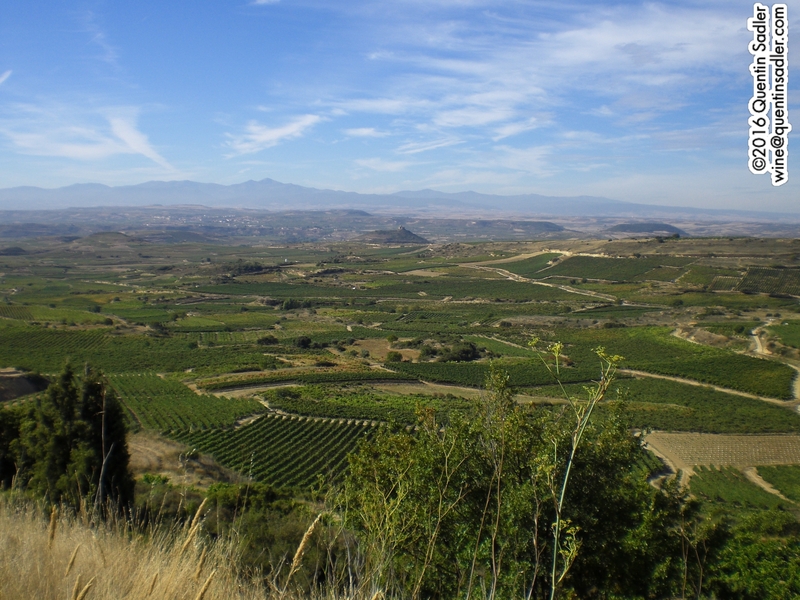 Rioja had certainly advanced by the late 1800s, but was not yet entirely sure of itself. True the wines had a market in Spain and some quality Rioja was exported in bottle, but it is highly unlikely that Rioja would have developed as far and as fast as it did without further French influence. Just as Rioja was getting started, Bordeaux was in deep trouble. Oidium and Phylloxera took a heavy toll on France’s vineyards from the 1850s to the the 1890s and so Bordeaux struggled to produce enough wine. Even when they had solved the Phylloxera problem by grafting their grapes onto American rootstocks there was a long, wine-less wait for the new vines to mature. Luckily Rioja had wine to spare, the quality was good, it had been made using modern French techniques and so perfectly suited the wine starved French market. Indeed to a large degree the style of Rioja that we know today was a French invention. The long barrel ageing was a deliberate attempt to make the Rioja destined for the French market to taste more like Bordeaux did at the time. 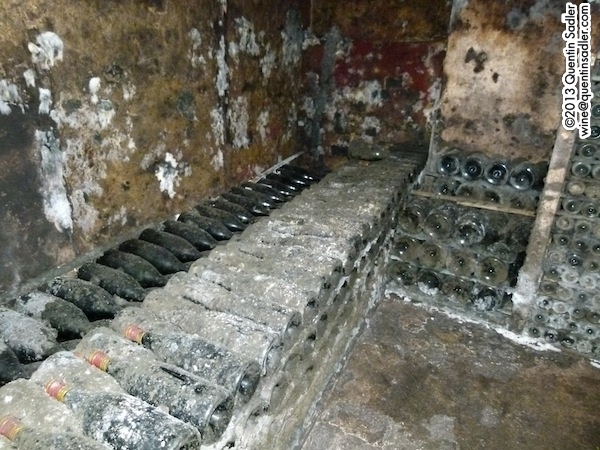 So successful was it that the techniques quickly became used for the entire production, not just the wines that were reservé for the French market. It is tempting to assume that Rioja as we know it emerged into the world fully formed in the mid 1860s. Certainly Riscal and Murrieta were quickly followed by a wave of other bodegas that are still with us today – these include López de Heredia, CVNE, Muga, Bilbaínas and many other famous names. However, although the basics of the techniques – or recipe – had become established, the fine details took some decades to develop. The consumer was given wines that had already been aged and so were ready to drink and had little or no sediment. The vessel the wine was aged in gave a rich, sweet vanilla character that enhanced the wine’s natural fruitiness – this is an important consideration as in the days before modern technology and cold fermentation it was much more difficult to make fresh, fruity wine. So strange as it may seem, unoaked Rioja – now officially categorised as Joven – is an entirely modern development and has only been around for the last 40 years or so once winemaking made it possible. For nigh on 100 years, Rioja relied on oak to round out the wines and give them a richness they otherwise lacked. Rioja barrel ageing at CVNE. Rioja ageing in bottle at CVNE. The process of ageing the wines was called raising or criar – it is the same word for children and plants – and so the oak aged wines themselves came to be called Crianzas. As well as being the collective word for any oak aged Rioja, Crianza is also the official classification term for those Riojas aged in wood for the shortest time. Between the 1860s and 1960s all red Rioja was barrel aged and ageing was the most important consideration. So much so that until well into the 1960s many Riojas – and other Spanish wines – were labelled with no mention of vintage. Instead the vital piece of information on the label was how long it had been aged for and so they were labelled as 3er Año – meaning it was bottled in the third year after harvest. More expensive wines were labelled as 5˚ Año, meaning it was bottled in the fifth year after harvest. This tradition clung on into the 1980s for bottles in Spain anyway and I remember being very confused by it during my early days in wine. The terms Reserva and Gran Reserva are so strongly associated with Rioja that it might surprise some to learn that they did not exist before the very late nineteenth century. Apparently the expression stems from French wine companies reserving certain barrels of Rioja that they would ship home to beef up their own wines. It was not until the 1920s that Reserva and Gran Reserva started appearing on labels. Throughout history decrees had been issued regulating where Rioja wines could be made and as we saw during Manuel Quintano’s time, rulings had been made about how it could be made. It was not until the 1920s, with phylloxera beaten and a ready market for their quality wines, that serious attempts were made to legally define Rioja. Crianza: Wines which are at least in their third year, having spent a minimum of one year in casks and a few months in the bottle. For white wines, the minimum cask ageing period is 6 months. Reserva: Selected wines of the best vintages with an excellent potential that have been aged for a minimum of 3 years, with at least one year in casks. For white wines, the minimum ageing period is 2 years, with at least 6 months in casks. Gran Reserva: Selected wines from exceptional vintages which have spent at least 2 years in oak casks and 3 years in the bottle. For white wines, the minimum ageing period is 4 years, with at least one year in casks. 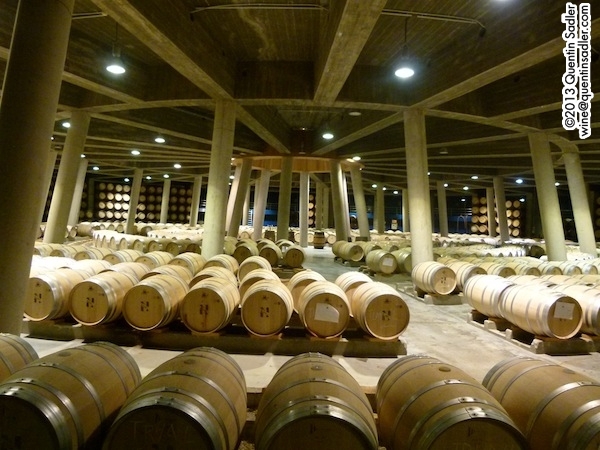 As you can see the rules require aged Rioja wines to be aged in oak barrels, or casks – chips and staves are not permitted – and these must be of the Bordeaux type that contain 225 litres. There are no restrictions as to the type of oak, but American oak has always been the most widely used. 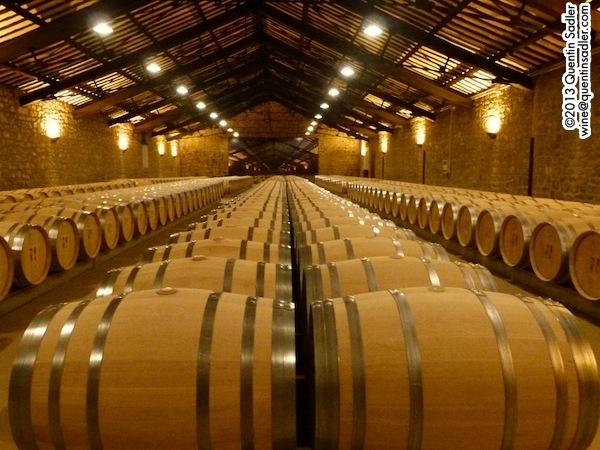 Although we overwhelmingly associate Rioja with American oak, some producers champion French oak and its use is increasing. Some use just French, but I have noticed a trend for Riojas to be aged mainly in American oak with a small amount of French, typically 15% or 20%. Normally the wine would be aged and then blended, but to avoid this Bodegas Beronia for instance use barrels which have staves of both American and French oak. 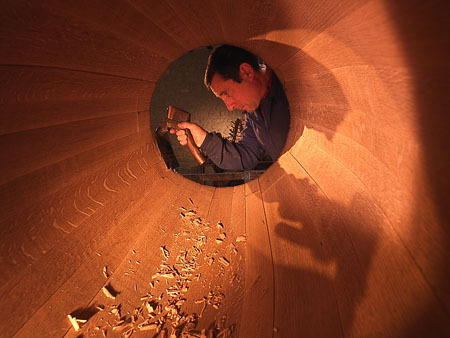 French oak is split, not sawn and so the grain and pores never open as they do with sawn American oak. In addition the kiln drying of American oak concentrates their lactones, which accentuates those creamy vanilla notes. The result is that French oak gives a more restrained and subtle character of spice and cedar. Using a combination of the two can often make the wine seem tighter, firmer and, some might say, more elegant than using American oak on its own. Of course many bodegas are experimenting with other oaks and using them too. Hungarian, Slavonian and Russian oaks can all be found in Rioja today. Stylistically they lean in a similar direction to French oak but give less spice character. In my view there can be no doubt that oak has been good for Rioja. Most Riojan winemakers seem to think that American oak has been good for Rioja too. It certainly seems to me that without the clear identity that American oak brings, the easily definable and tasty vanilla character, then Rioja would not have enjoyed the success that it has. The use of oak, especially American oak, made the wines seem richer and more full-bodied than they actually were in the 19th and 20th centuries. People liked the aromas, flavours and silky, smooth texture and found it easy to define what it was they liked in these wines. The style is approachable and so it is no accident that Rioja is often one of the first red wine styles that drinkers enjoy. Old vines in Rioja Alavesa. Of course if oak can be seen as generally good for the region, it is also true that some producers feel a little constrained, albeit benignly, by the Reserva and Gran Reserva classification system. They want some of their wines to be an expression of the vineyard and the winemaking without reference to such a classification, one practical reason is that if a bodega produces a top wine as a Gran Reserva in one vintage and as a Reserva or even a Crianza the next, then some consumers might well imagine the wine to be inferior – which is not necessarily the case. The classification is about ageing and not quality. That is why increasingly many bodega’s top wines are now defined as Vino de Autor or signature wine and marketed without reference to the Reserva / Gran Reserva classification. CVNE’s Real de Asúa and Pagos de Viña Real are both examples of this, as are Roda’s Cirsion, Beronia’s III a.c, Contino’s Viña del Olivo and Muga’s Torre Muga amongst many others. 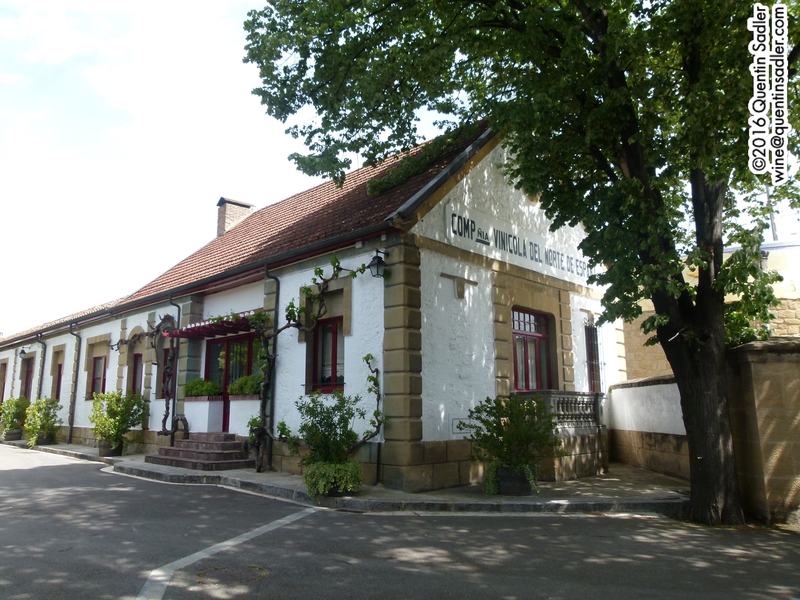 The buildings at CVNE date from 1879. Concrete fermentation tanks, modern and hygienic in the 19th century. Nothing ever stands still and it is instructive that as grape growing and winemaking has become more technically advanced and accomplished then Rioja has branched out. As soon as cold fermentation made attractive, fruity and unoaked jovens possible, they made them. These can be enjoyable wines and offer great value for money, but they lack that classic oaky Rioja character and it is hard to envisage anyone ever producing a truly fine and complex unoaked Rioja. 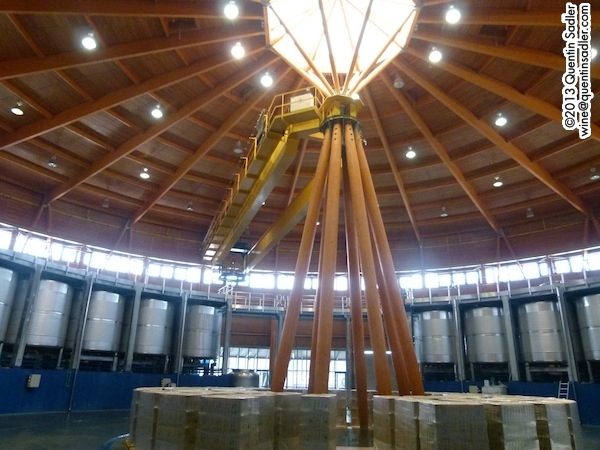 The modern fermentation tanks at Viña Real. All the producers I spoke too agreed that oak has helped to define their wines and to give Rioja a clear identity. Some saw the future as having increasing use of European oaks to produce more restrained wines, while most were of the opinion that American oak would continue to dominate Rioja – albeit with French and other oaks used as seasoning. 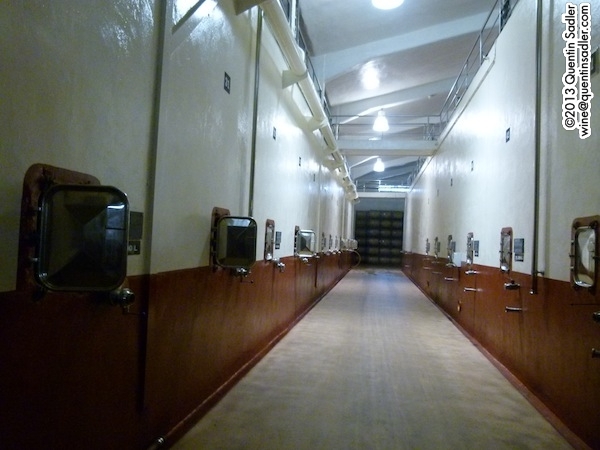 The dramatic barrel room at Viña Real. No one seemed in any doubt though that the future of fine Rioja wine will be glorious and is as closely linked to oak as its past.